The Strawberry Challenge, Part Deux: Jam! After the strawberry picking I wrote about a few days ago, a friend and I used some of our bounty to make jam and can it. I observed my mom can a multitude of foods as a kid–jam, jelly, pickles, tomatoes, corn, and soup, to name a few. However, I’d never canned anything myself. Though canning can be anxiety-inducing, I can now say that it in all honesty is wasn’t that difficult. The results of our jam canning journey were fantastic, I have to say. Most of the time, you will find jars and lids in the disposable containers section of a store, near the aluminum foil, plastic wrap, and all that type of thing. The pectin I reference in the recipe below will also most likely be found near the jars. You can reuse the jars and the rings you use to secure the lids. However, you cannot reuse the lids themselves. You can buy separate boxes of lids for future canning endeavors. Though I did not know this at the time, canning jam does not require a boiling water bath, which we did here. My mom says it’s not necessary….I’ll discuss that more later. It’s helpful to have a “jar grabber” to fetch hot jars from boiling water, but metal tongs also work. You can buy a jar grabber, funnel for filling the jars, and a magnet for retrieving your lids from the water in a kit. These kits are sold in the same section of the store as the jars themselves. Take the lids and rings off your jars, put them in a pot full of water, and bring to a boil. Immediately when the water comes to a boil, turn off the burner and leave the lids until ready to use. In a separate large pot, bring water to a boil. It should be enough water to reach 1 to 2 inches above the top of the jars. Then, turn down so the water is still boiling, but much more slowly. Drop your jars in the water using the jar grabber, cover, and boil for about 5 minutes. 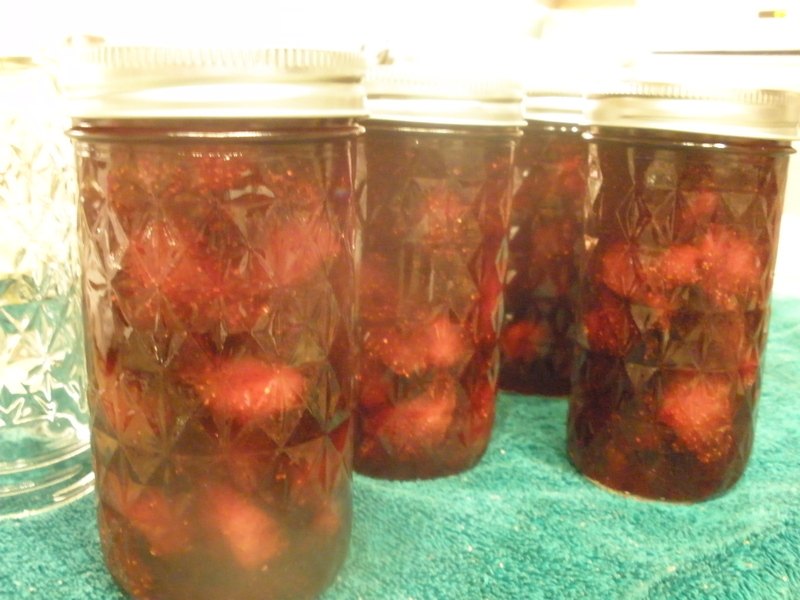 The purpose of this process is to disinfect the jars so your jam will not mold. Get out a big towel, remove each jar, empty the water, and set on the towel to dry. Step 2: Make the jam. 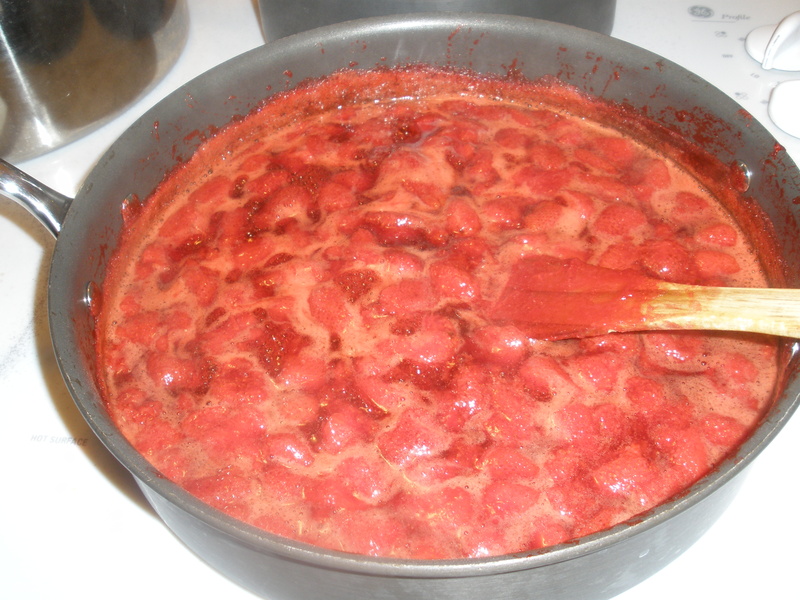 Get out a big saucepan or pot, and combine the strawberries and pectin over medium heat. 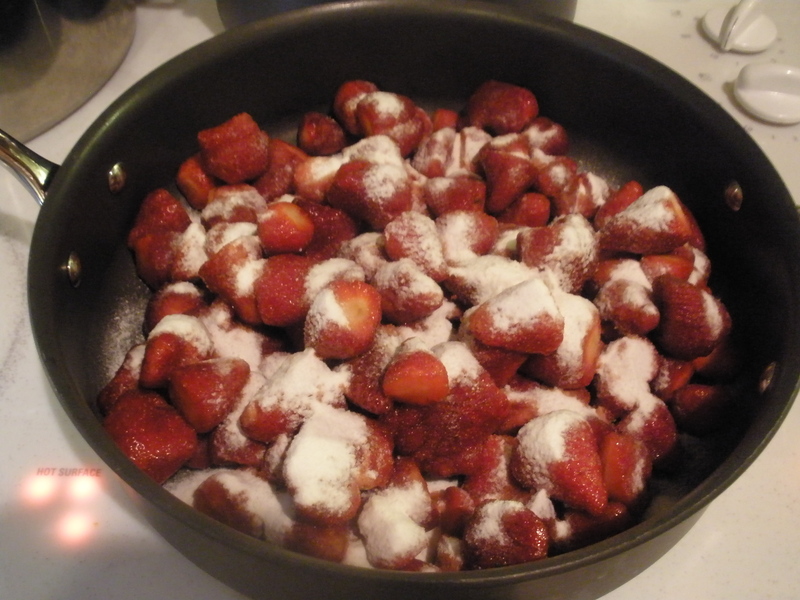 No water necessary–you’ll be amazed at how much water the strawberries release as they cook. 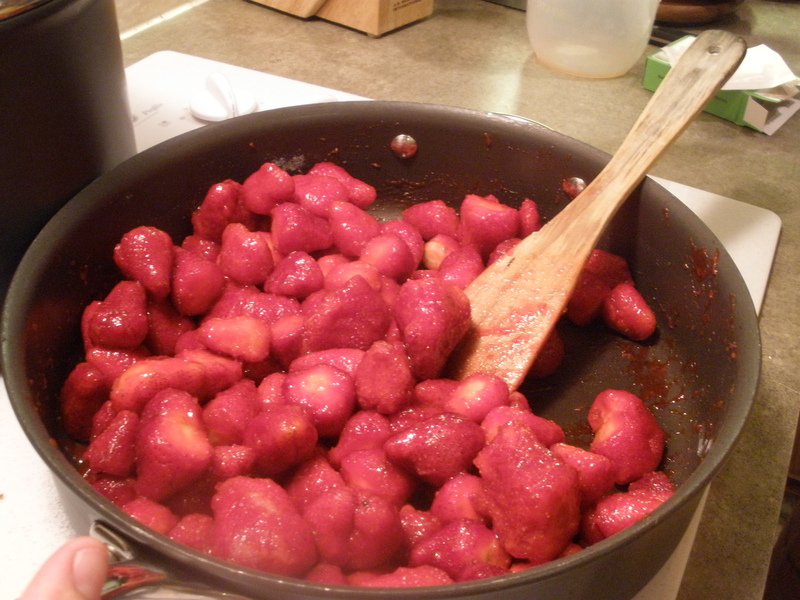 Stir every few minutes, and bring the strawberries to a boil. Add the sugar, and stir constantly as the jam mixture boils (about 1 or 2 minutes). Turn the heat down and continue stirring the jam for a few minutes. If you want your jam to be smoother, feel free to mash the berries before cooking. I prefer chunky jam, so I left the berries whole. Step 3: Can the jam. Remove the jam from the heat. Prepare the jars. Dry off any remaining water from the sterilization process. Retrieve your lids from the water using the magnet. Have the rings at the ready. Place the funnel over the first jar, and pour in the hot jam, leaving about 1/4 inch of head space. 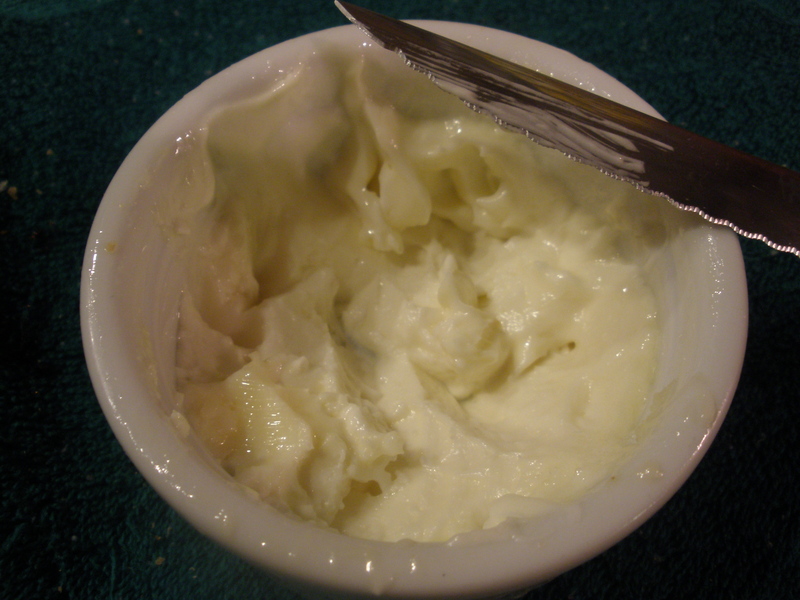 Wipe the edge of the jar to remove any spillage, cover with the lid, and screw on. Repeat until you have filled all your jars. The above recipe produced almost 5 full, 12 oz. jars of jam. I did not have enough jam to completely fill the fifth jar, so I left that one out to refrigerate. The other four jars are preserved for a later time. 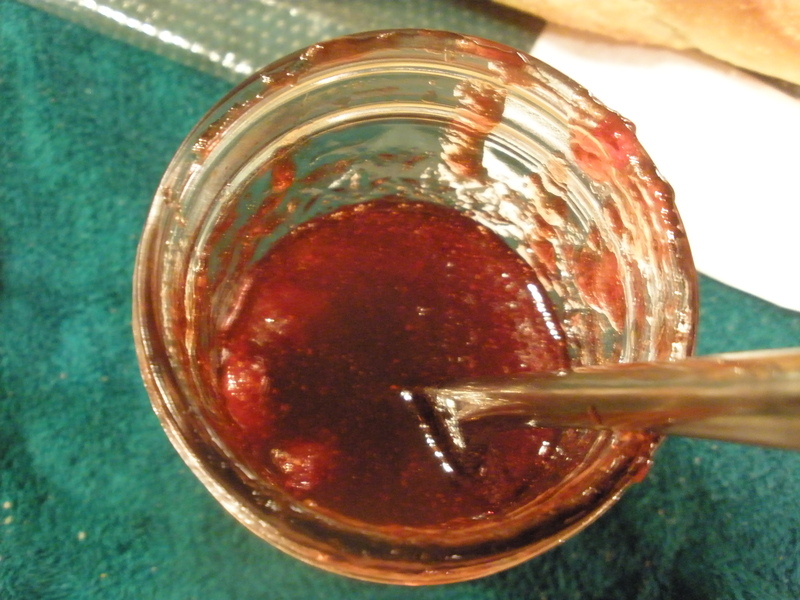 You’ll notice as the jam and the jars start to cool, the lids will make a popping sound. This means that they are sealed! After 12 hours or so, check all the lids for a vacuum seal by removing the ring and checking to see if the lid is secure. If so, you have a seal, and the jam will be good to use for about a year. A fun variation on this jam is to add some balsamic vinegar. Yum! To cap off the experience, we at some of my jam with a fresh baguette from Sweetish Hill Bakery in Austin, farm fresh butter (purchased from the farmer’s market), and some wonderful balsamic vinegar from Bella Vista Ranch in Wimberley, Texas. How delicious!